W. Edmund "Ted" Fancott attended the Leicester School of Architecture. After receiving his diploma in 1930, he worked in the office of A. H. Hallam. Fancott later joined the firm Stockdale Hanson and Sons, one of the leading British design firms at the time. During the years leading up to and throughout the Second World War, Fancott gained experience at several other firms and designed a wide range of buildings. Fancott moved to Canada in 1947. 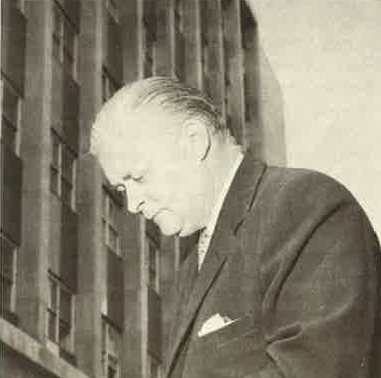 By 1949 he had joined the Department of National Defence and eventually became the chief architect of the department. Fancott later transferred to the Department of Public Works where he worked on many hospital projects and was later responsible for all the northern construction undertaken by the department. Work included projects like the Frobisher Bay settlement and the design concepts for the Department of Mines and Surveys Booth Street complex. In 1957, he was hired as the Ottawa representative for Green Blankstein Russell and Associates, the architects of the new National Gallery of Canada in the Lorne Building. GBR had placed first among 105 entrants in a national competition for a new building, but had to contend with this consolation prize (a temporary gallery that could later be converted into government offices). Through a running battle between the Gallery's Board of Trustees and the Department of Public Works the Winnipeg firm managed to deliver a building of some quality, with Ted Fancott on the ground as their man in Ottawa. After the Lorne Building/National Gallery project, Ted Fancott was involved with other GBR projects including the Riversde Hospital and Maycourt Home.